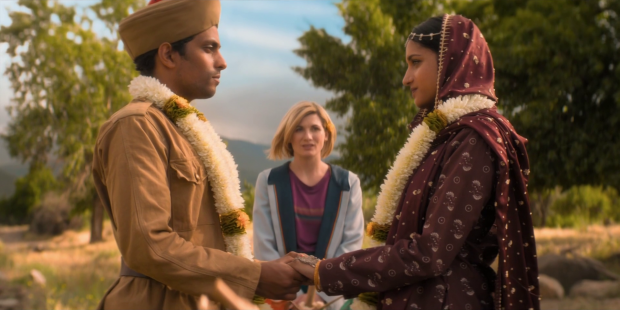 Doctor Who takes Team TARDIS back to India in 1947 on the day that the Partition of India became a reality after Yaz asks the Doctor to show her a piece of her family history. Time travel brings a large degree of curiosity with it. There is the temptation to be present at the big events but there is also a more personal desire to see family members when they were young before they became the person that you know. In this case, Yaz is given a broken watch by her grandmother, Umbreen (Leena Dhingri) that didn’t belong to her grandfather and is clearly a point of tension for Umbreen that she would rather keep to herself. Instead of respecting that right to privacy, Yaz asks the Doctor to take her back in time to learn what the watch represents. This episode is very much a personal story about family history but has the added bonus of having a significant historical event as its backdrop. The Partition of India detail remains in the background throughout but becomes really important on a symbolic level as the whole point of it was to create barriers where the personal narrative is about uniting people so there is an obvious contrast playing out that works really well. Young Umbreen (Amita Suman) is preparing to marry Prem (Shane Zaza) but their union is met with scrutiny as Umbreen is Hindu and Prem is Muslim which makes their marriage unconventional by the standards of the time. Words like “tradition” are thrown around a lot to justify this opposition but Umbreen is very forward thinking and believes that new traditions could and should be created. As far as she’s concerned their relationship should be celebrated as it represents a step forward and a union between two things that had previously been separated. This comes into play towards the end of the episode when they observe both Hindu and Muslim traditions to solidify their commitment to one another. Like “Rosa” this is an episode about division and how unnecessary it is. Prem and Umbreen represent a much larger issue and the fact that their marriage happens the same day India is divided is definitely no accident. The separation of India into two independent states is basically foreshadowing for what their marriage will amount to. Even though they have chosen to be together circumstances will force them apart and there’s nothing either of them can do about it. Doctor Who this season has dealt with harsh reality more than once and this is yet another example of that. In this case, love most certainly doesn’t conquer all. The idea that Humanity is its own worst enemy has been a common theme this season. Each episode has had an external threat of some sort that doesn’t turn out to be the real problem. The exception to this is “The Woman Who Fell To Earth” but even that episode has a Human being carry out an unnecessarily violent action. 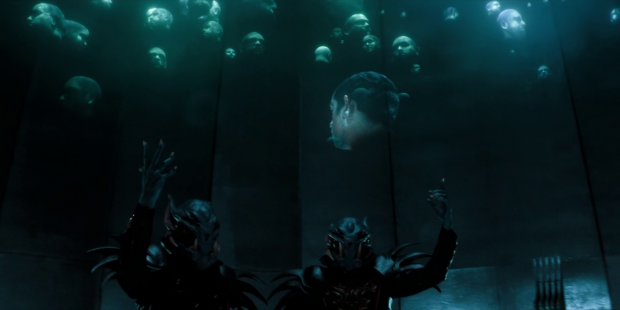 This episode has a group of aliens called the Vajarians who seem to be malicious at first but are revealed to be misunderstood once the Doctor has a chance to talk to them. They are on Earth to honour those who die alone and bear witness to their passing so that they will be remembered by someone. Their compassionate nature is a lesson learned after the wrong attitude all but doomed their species. This serves as an obvious cautionary tale for the Human race and how so much energy is spent on putting up barriers. As always the storytelling isn’t subtle but it’s a timely message that definitely resonates. Unfortunately their presence means that Prem has to die because that is what history recorded which makes for another similarity to “Rosa” as that episode also had the characters come to the realisation that inaction was the only possible action that they could take in order to preserve the natural order of the timeline. It’s a tough moral choice for the characters to consider and there’s plenty of strong emotional beats created by this. The scene where the Doctor tells her companions that Prem is fated to die is excellent because of how much emotion the characters exhibit in that moment. For starters the Doctor is almost reluctant to tell them the truth because it’s a strong burden to bear that she has experience with but they don’t. Her decision to be upfront about it despite that speaks volumes about how much respect she has for the group. Everyone else is understandably upset though they show that they are decent people by not accepting the Doctor’s offer to leave and let history proceed as it should. Instead they accept that they are now part of this and choose not to abandon the people involved when they could offer some comfort since the wedding hasn’t happened at this point. The tragedy associated with this reveal works really well because a great deal of time is taken to establish Prem as a likeable presence who believes in a brighter, more inclusive future. Yaz is a good focal point for this as she has to deal with the fact that her grandmother is marrying a man who isn’t her grandfather and understand why her grandmother would keep this man a secret. She is open minded enough to not let her personal feelings get in the way and see how good a man Prem is which makes the point where she has to watch him die all the more powerful. Having the Doctor and her companions take on a more passive role in the plot has its drawbacks. Since this season has been largely defined by the team being observers more than active participants it’s easy to think that the episodes don’t have a lot of weight to them because the characters don’t really do anything other than watch things happen. 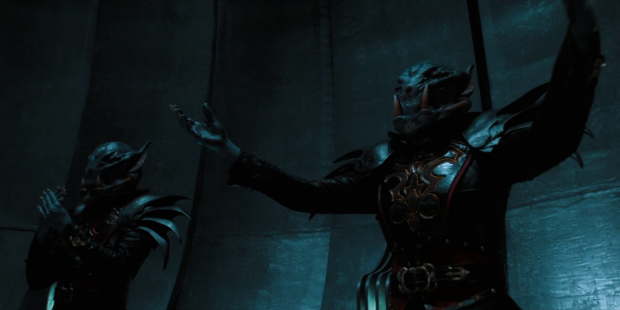 The Vajarians could have been removed entirely and the episode would almost be no different and to my mind that reduces the depth of the various aliens encountered in a given episode. On the other hand the writers clearly aren’t going for the well developed alien threat as they seem more interested in making the point that Humanity has a lot of inner demons that need to be defeated. Having aliens that may or may not be a threat in each episode sends a strong message about how easy it is to demonise those who are different and make assumptions about their intentions that might be completely wrong. This is a mistake the Doctor herself makes this mistake as she assumes that the Vajarians are hostile when they first appear and has her mind changed later. This is clearly intentional as it shows the Doctor as being fallible and prone to making these sorts of assumptions but for me it doesn’t make sense as she has been travelling through time and space for a very long time so should already have learned not to make these assumptions. It makes sense for Human companions to do this because they’re naive as to how the universe works but the Doctor should definitely know better. 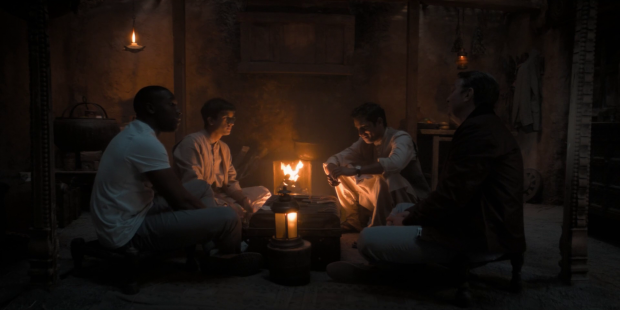 The passive nature to the team’s involvement in the larger story is also problematic for Yaz as it means she does very little in a story that should be all about her. It’s not a total waste as there is still a really strong scene where she processes her feelings about what she is witnessing and has Graham help her put it all into context. He makes her see that Umbreen isn’t her grandmother yet so she shouldn’t think of her in that context. Umbreen hasn’t had the time to decide what this experience means to her and find her own way to tell the story yet to Yaz shouldn’t hold her to that standard. He also makes a fascinating point about whether people actually know the truth of their lives or if living them automatically skews their perspective. Yaz is encouraged to enjoy the moment and come to her own conclusions about what it should mean to her. It’s a great character driven scene that makes for a great moment between Graham and Yaz where she gets the benefit of his life experience. Once it becomes known that the Vajarians aren’t a threat and that Prem has to die the episode shifts gears into becoming an emotionally resonant story about people and how tragedy affects them. Prem’s death is at the hands of his brother, Manish (Hamza Jeetooa) who never approved of his marriage to Prem and acts out against this by bringing a death squad to the aftermath of the wedding. There is some attempt to give him a backstory around being forever changed by fighting in a War and being too young to cope with how that changes him but it doesn’t really work as there isn’t enough time to let this backstory sink in so it comes across as feeling rushed. Shaheen Khan doesn’t entirely connect with his character which makes his performance feel less than believable as well so the climax of the episode largely falls flat despite the strong material on display. When some elements aren’t quite clicking it makes things less effective on the whole. Prem’s death scene was still really effective because of the intensity that existed between the two brothers on opposing sides of an issue after having risked their lives to fight for their freedom. In that moment there is the sad realisation that this isn’t what Prem fought for and there’s a suggestion that Manish will come to regret this some day as he is entirely motivated by anger in this moment that will eventually fade into the guilt associated with knowing he sentenced his brother to death. The Vajarians committing Prem’s image to an eternal memory signifying that he will never be forgotten in some way is really moving and suggests that there is always hope even in the darkest of times. A powerful episode that creates a wonderful contrast between the desire to unite people and the tendency of the Human race to drive them apart. The catalyst for the plot is Yaz learning the significance of a watch gifted to her by her grandmother which ends up opening her eyes to a huge part of her family’s past that she didn’t know about. Once again this is a story where the Doctor and her companions are largely passive as they have to sit back to allow history to play out as it should. This means that Yaz sits on the sidelines of what should be her episode though she has some really good moments such as her conversation with Graham about how people change over their lives and what is actually the truth of a moment. Prem’s death scene is really moving and his image being committed to a memory bank showing that he will be remembered is a powerful display of hope in the darkest times. Once again the aliens included aren’t really a threat and the idea of jumping to conclusions is explored though I don’t think the Doctor should have jumped to that conclusion given the experience that she has though the point is well made about how easy it so to make assumptions. Prem and Umbreen are really strong characters which makes the fact that they have to be torn apart by circumstances all the more moving though the characterisation of Manish doesn’t land as well as it should which makes the stand-off between brothers less effective though it’s still a tense, powerful moment showing how strong a person Prem was.